This supercomputer visualization sheds light on data gathered through new telescopes from hard-to-observe areas of the Sun. Scientists using NASA’s Solar Dynamics Observatory (SDO) have recently observed two sizes of solar “tornado”—rapidly rotating, funnel-shaped structures. Both the small and the large type are driven by magnetic energy, as opposed to the temperature and moisture contrasts that fuel actual tornadoes on Earth. The smaller, more-frequent type shown here is the result of a 2012 discovery by a team of researchers in Norway, Germany, Sweden, and the United Kingdom. In this animation of the data, a virtual camera travels around, above, and into the funnel of a solar magnetic tornado. As lines swirl around the funnel, the colors denote how quickly the plasma is rotating (from slower yellow to faster green and turquoise). Outside the funnel, the red lines represent the magnetic field. The colored patch below the funnel is the magnetic footprint at the Sun’s surface. At any moment, about 11, 000 of these tornadoes, some of them as wide as the United States, may be spinning across the Sun’s surface. Each one can pack winds of more than 10, 000 miles per hour. The tornadoes were discovered using the Swedish one-meter solar telescope, together with SDO data. 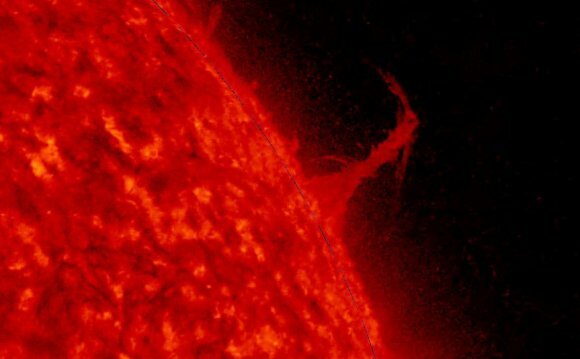 Researchers think that heated plasma (electrically charged gas) rises through the tornadoes into the Sun’s corona, or upper atmosphere. This could help explain a longtime mystery: how the corona reaches temperatures of up to 5 million degrees Fahrenheit. The larger type of solar tornado (not shown here), which can sometimes be wider than a hundred Earths, is related to bursts of magnetic flux called coronal mass ejections. 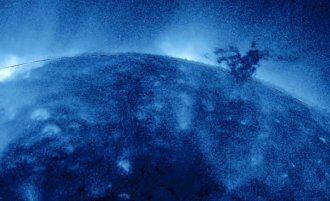 Incredible Footage Of Plasma Rain Falling On The Sun!